School teacher says classes would resume as normal today despite damage to dormitory building. Quick action by members of the com­munity and National Fire Authority personnel helped contain a fire from destroying a nearby mosque at the Islamic Institute in Sabeto yesterday. Teachers from the institute thanked mem­bers of the community for their quick ac­tion to pull out machines and save white goods from the building. 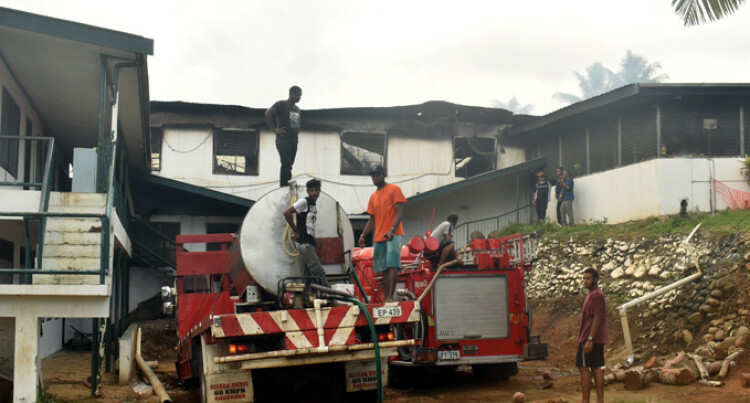 Two fire trucks from the Nadi Fire Station were at the scene to douse the fire, with wa­ter carting trucks delivering water also. A teacher at the institute, Shofeed Ali, said classes would resume as normal today de­spite damage to dormitory building. He was at the school compound when the incident occured. “I went to pick up my child from the prima­ry school and on my return I saw the flames coming out of the dormitory building,” Mr Ali said. “The institute just opened for classes today (yesterday) with 10 to 12 students, but they all managed to escape. He added classes would not be interrupted despite the incident completely destroying the two-storey dormitory building. “For the time being we will do a temporary dormitory for them, maybe we will join all the classes in one,” the teacher said. A statement obtained from Police said: “The Islamic Institute School in Sabeto caught fire and flames were spreading to the Mosque, but the quick action by the au­thorities managed to control the blaze from spreading.